"At lunch one day at last year's July School of Art Fashion, Phyllis Hoffman DePiano, CEO of Hoffman Media, showed off a shirt she had bought at a specialty boutique. 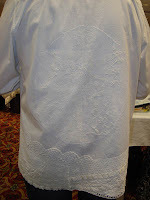 The Shirt was a ready-made men's tuxedo shirt with the bottom half of the shirt replaced by an interesting, crazy patch if you will, assortment of modern bits of lace and doilies. The shirt was stunning with interesting textures and details that were just plain fun to look at. As it passed my table, I looked at it hard and it occurred to me that I could make an "in-expensive knockoff" of that shirt. In fact that is why Phyllis was having it shown; someone was making money by sewing interesting original outfits for a high-end boutique. I am in a unique position to collect bits of lace since I live in France. Old lace can be found in the most surprising of places and I have been collecting since I moved here over 3 years ago. 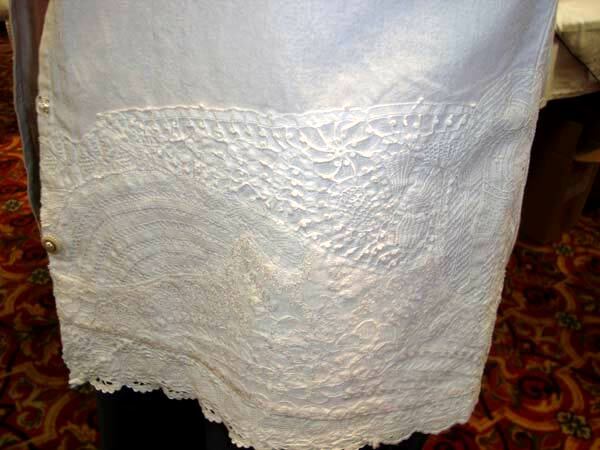 On my rendition of the shirt is modern Battenberg lace from Brugge Belgium (off of the final markdown table) as well as old lace pieces from Spain, England, Germany, Luxembourg, Belgium and of course, France. I thought the hard part would be finding a well-made white shirt that I liked. In late January, I finally found one. Surprisingly though, what proved extremely difficult was to actually cut old pieces of lace bits apart for use on the shirt. There is no replacement if I cut incorrectly! As for construction, most of the lace is machine sewn down with hand tacking to make sure the centers of the larger lace pieces hold in place. 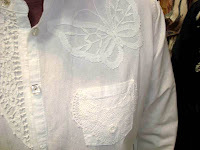 The butterflies and the piece over the pocket were hand sewn onto the shirt, as is the large Grecian looking woman on the center back. 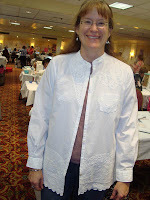 To construct the bottom of the shirt, I started the crazy patch design at both ends where the button and buttonholes are. I then added lace making sure it all met together in the back in a way that one couldn’t tell where I started and stopped. Unlike the original, I decided to leave the shirt underneath intact to help support the older lace. 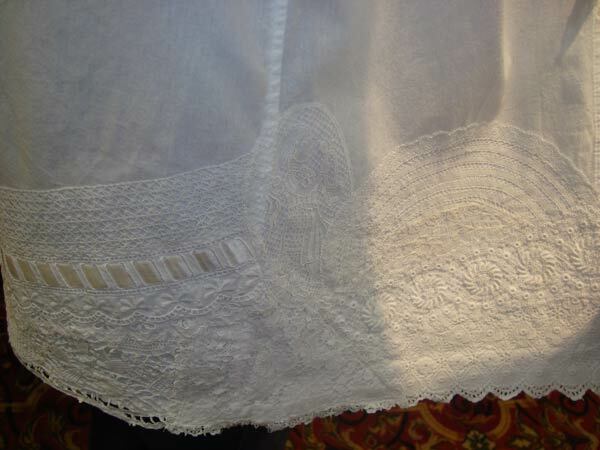 Once I was done sewing on all of the lace, it became clear that the original garment's buttons no longer matched. A quick trip to the town's "Mercerie" or notions shop made for a fun time picking out the last of the stock of at least 5 different interesting buttons. 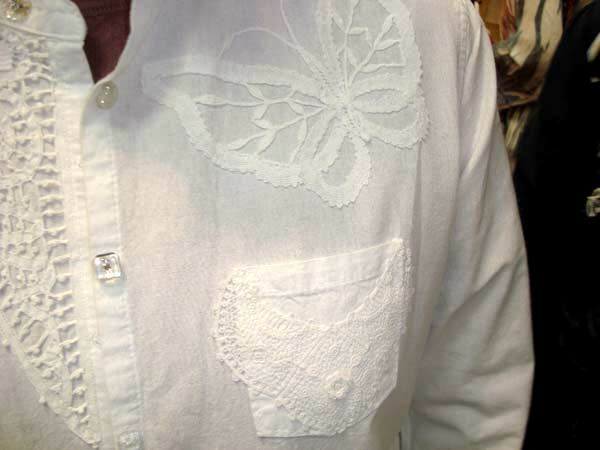 The mismatching buttons add to the texture of the shirt making the final project complete."